It has only been a few years, but it feels like a lifetime for you, the founder and leading CEO. Along the way, you have learned valuable lessons about taking risks, managing people and satisfying customers. With all that experience you have garnered as a business owner, this day should feel pretty good. Why is that? Today is the day you have decided to open your own corporate headquarters. For whatever reason, hopefully a profitable one, the company is structured so that a new corporate headquarters office with all new business interiors is required. Of course, this is something to be proud of and you truly should be. For any entrepreneur, like getting your first credit card for business, opening their first corporate office is a large milestone in his or her career accomplishments. Since you have made it this far, dressing up your head office is not something to skimp out on. Otherwise, you should see how to decorate your office on a budget. Corporate headquarters is an extension of your brand and what you have built. As a proud business owner, your company headquarters must match the culture and environment the company has created over the years. All business interiors, including office furniture like desks, tables, chairs, lights and others, are an opportunity to create the corporate interior design that you and your company deserve. In addition, setting up your business interiors also gives you the chance to upgrade your company image or working environment (at least for the individuals who will be working at headquarters). Since mostly executives work at the corporate office, it might be nice to treat them with some of the better amenities because of the extra hard work that they have put in over the years. Additionally, when you hire a corporate event planner, they will have a good idea of the feeling of the company. Once your corporate headquarters is all set up and looking great, you will be happy that you made the investment in high-quality commercial furniture to give your company brand strength. Just think about it, when other employees come to the new head office, they should see a place where they want to work someday too. Be careful though. If you go too over-the-top, employees could see executives as being too spoiled and wasteful. Obviously, your business interior investment should be within reason. As mentioned earlier, the business interiors will portray a feel for the company. When choosing your office furniture, take into account your budget, workspace, seating and storage. 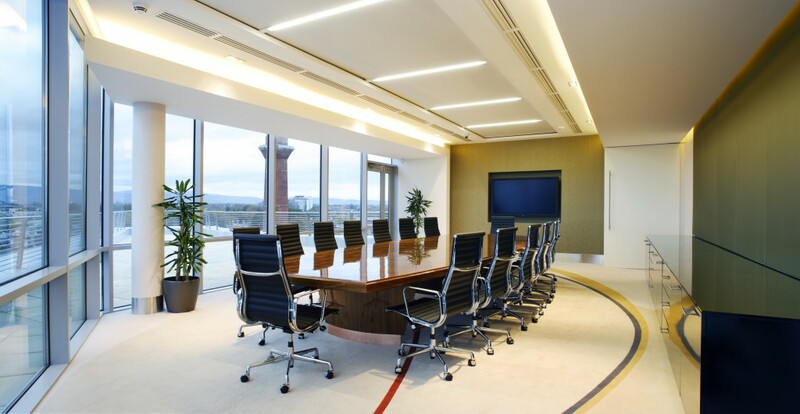 You and your executive team will need to be comfortable with the office design and layout. For example, the conference room for meetings should be somewhere centrally located. This way, various team members can easily access the space. Depending on the usage of the space, you may have to buy office furniture solutions for various layouts. Before you go buying office interiors, you should definitely find some inspiration. You do not want any business to be a mess of clashing aesthetics and designs. This will negatively impact your employees’ ability to focus and be productive. Just like coffee prices indicate what type of coffee shop you are visiting, your office interiors will indicate what type of business you operate. Instead, search for some inspiration. Pinterest is a great place to start looking for interior design ideas. Then, create a cohesive business interior design plan that accounts for different rooms and different purposes. This way, you can be sure that every item you buy fits in nicely with your aesthetic and overall business culture. Certainly, business interiors are a great way to upgrade any office, especially a company headquarters. Do not just use what free digital signage your suppliers and partners give you. With the right furniture and office design, you will be ready to take your company to the next level. The new upgrades will go right along with your growing company. I agree that business interiors are a great way to upgrade an office, I think it’s important that your interior should be working hard for your brand too.